I remember meeting a colleague for lunch, “I’ve got to get out of here, I’m suffocating” I said through desperate tears. “The environment is sucking the life out of me.” Workplace drama and an unhealthy environment had taken it’s toll. There have been a few times in my life where I was in toxic environments, both personally and professionally. Whether it was roommates, colleagues or bosses the environment was emotionally draining. Author Dr Swenson says “To be healthy, we require margin in …emotional energy,” for “when we are emotionally resilient, we can confront our problems with a sense of hope and power. When our emotional reserves are depleted, however, we are seriously weakened.” Have you ever felt seriously weakened? Depleted emotionally? Envision a better future: Imagining life better in the future is a huge key to making it reality. You can’t change unless you see something different is possible. Envisioning a better future can be simply asking yourself the following questions about having healthy relationships (personally or professionally): “What does it look like? Who do I know who has them? What are desirable attributes I can identify? What would it mean to have people in my life with these attributes? Starting with answers to questions like these set a vision of where you want to be and makes it easier to assess what needs to change to get you there. Create Boundaries: Just like boundaries with time are important, boundaries in relationships are just as important. There is a little girl in my daughter’s life who is a bad influence and we’ve had to set boundaries around their friendship. Yes, they can play together with eagle-eye supervision, but no they can not have sleepovers. The same has been true for me, certain friendships have boundaries; there will be things we cannot do together and things I just won’t share about my life. All because I need to protect the access to my heart and the influences in my life. Social Support: As I was unwinding myself from toxic relationships, new relationships were absolutely required to prevent me from reverting back to old patterns. Practically, I had to forget the phone numbers of the people and hide (or unfriend) on social media those who were holding me back. I also had to do the work to develop new relationships. Unfortunately, a new social support wasn’t going to fall into my lap, so I had to be apart of creating it and my vision for what they looked like created a litmus test for what I was looking for in my new support system. Reconcile Relationships: While some relationships had to go, some relationships could be salvaged through reconciliation. For example, I recently had to call a colleague from 10 years ago and apologize. I didn’t know what I would encounter on the other end of the phone — would my apology be accepted or rubbed in my face. Obedience to reconcile was hard; however, getting the words “I’m sorry” out of my mouth brought powerful emotional healing. Either way I knew forgiveness was powerful whether accepted or not. In this case, forgiveness wasn’t just accepted, it was reciprocal and the relationship was restored. When relationships are restored God gets the glory. Grant Grace: Granting grace helps alleviate emotional strain too. As much as I have grown personally and spiritually I recognize I’m still faulty and broken, far from perfect. Because I am not perfect, I cannot expect anyone else to be perfect either; screw ups must be: allowed. If God can grant me grace upon grace and daily forgiveness with my moment by moment repentance, then I can freely grant grace to others too. Even with grace, caution is still required. I must still mindful of my past behavior patterns and constantly ensure my relationships are healthy. 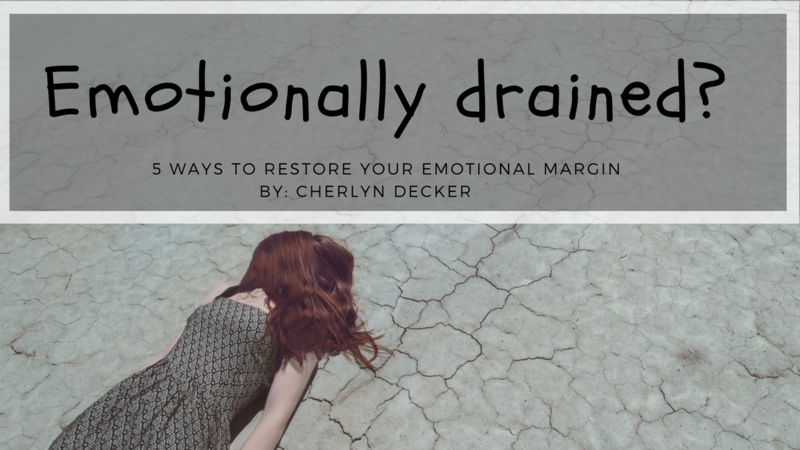 How have you found margin emotionally? Let me know in the comments below.